Just like the new Triumph Bonneville Street Twin and two Bonneville T 120s, the Bonneville Thruxton has also been thoroughly reworked for 2016, with seriously impressive hardware, apart from cosmetic changes to the motorcycle. The new Thruxtons are stunning lookers, with a dash of thrill added in. Now, we all know the Bonnevilles were the superbikes of yesteryear. They came in to make a humble beginning in 1968, but worked hard to build themselves the image of an iconic, classic British twin. The Triumph Bonneville Thruxton too, keeps an element of retro in its design. The large round headlamp looks classic, and so does the round analogue and digital twin-pod instrument display. The handlebars have classic rearview mirrors mounted on either ends. The wheels too, have wire-spokes. The tank has the typical Thruxton classic look, and the Thruxton R even gets a Monza-style fuel-filler cap. More about the R coming up in a bit. The Thruxton seat looks sporty, and twin exhaust pipes fit right in with the classic Thruxton appeal. The Bonneville Thruxton R, with the racing suffix, has a few nifty performance parts thrown in. It gets stainless steel exhausts without catalytic converters for added oomph, a more aggressive, hot-cam and washable air-filter. Apart from this, Showa big piston upside down front forks, Triumph-unique Ohlins adjustable suspension at rear, and Pirelli Diablo Rosso Corsa Tyres. The floating twin disc brakes in front have monobloc construction Brembo made calipers. Visually setting the R apart from the other one is a colour matched seat cowl, buffed steering headstock and larger section alluminum swingarm. The Thruxtons get a four-stroke, 8-valve, 1,200cc, parallel-twin powerplant, in a sporty state of tune. It has higher compression than the other Bonnies, a lighter crankshaft and a revised airbox to push in more, to get higher engine output. This higher spec engine delivers 11kgm of maximum torque at a 5,000rpm. The torque figure made by the engine is delivered at higher rpm as on the other Bonnevilles, getting closer to its 7,000rpm redline. The liquid-cooled engines offer ride-by-wire throttle control, and suitably styled throttle bodies that match the bikes retro character and look like carbs from yesteryears. A slipper enabled clutch is mated to the Thruxton’s six speed gearbox. Triumph has worked to not only make the new, more menacing looking bikes look high performance, but also on making them go like higher performance machines. As a result, you find the evergreen classic look comes in accompanied by some serious technology too. Triumph has three riding modes for the Thruxtons, ‘road, ‘rain’ or ‘sport’ to control the way the motorcycle behaves on the road. Also, you get switchable traction control and ABS for the brakes, to keep you on top of tricky situations. 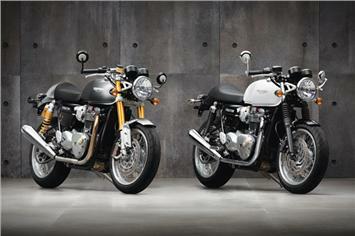 Again, much like the other Bonnevilles, we expect the Thruxton to be priced close to the present day one, here in India. With a stronger engine, that has been painstakingly tuned, and with the ‘R’ version included in the lineup, ensuring new Thruxton customers are in for a treat, and can’t ask for anything more.